Hello! Today I am sharing one of my spring break projects with you. I am back at work today but I thoroughly enjoyed every minute of my break. I actually didn't even mind going back to work after such a nice break. 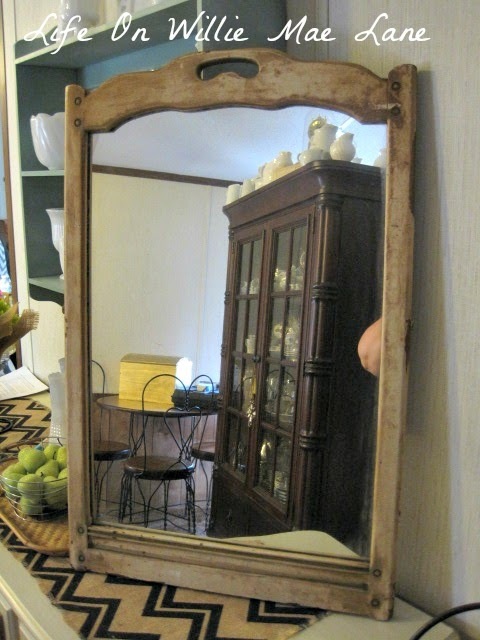 Anywho, you might remember this mirror (see below) I shared with you last month. I found it a thrift store for $5. It is old and heavy and I fell in love with the lines and details. 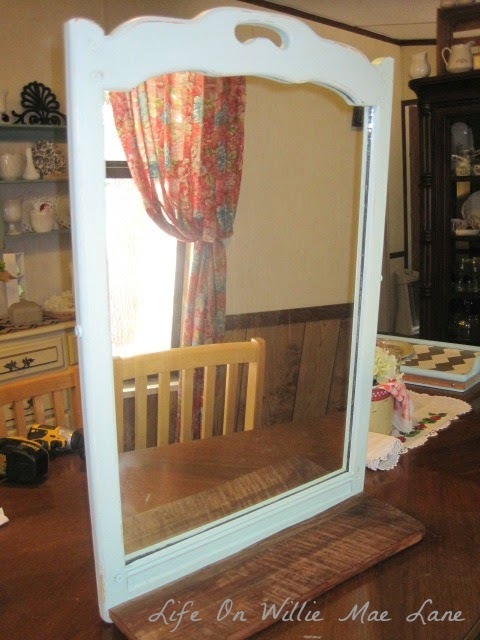 Originally I had planned to paint it and turn the mirror around paint it with chalkboard paint, but I had a change of heart. My home deosn't get a lot of natural light so I thought the mirror whoule be better than the black chalkboard to reflect light and make the space feel larger. I actually thought the mirror looked pretty sweet as it was, but I wanted to add a little color. I went through my stash of paints and came across this little Valspar sample tub I had bought a while back and forgotten all about. It was the perfect color choice for my mirror! The color is called Sweet Mint and it reminds me of the color of jadeite which I love! So, I added a little calcium carbonate to it and made my own chalk paint and got to work painting. I gave it two coats and then sanded off a little here and there to expose the former color and even the wood in a few places. After it dried, I waxed it and it was good to go. Sorry I did not take pictures of the process. I am not usually patient enough for that...lol! And, I was working on three projects at the same time! I'll share the others later this week. I also decided to add a shelf to the bottom to display some of my thrifted treasures on. I went down to dig around in daddy's pile of wood scraps and came across this piece which was exactly the right size! It is cedar and very rough hewn...I love the texture and uneven edge on the front. Here it is hanging on the wall. Looks good but I made it look even better. I love the way the distressing turned out. Here's a close-up of the wood shelf. See the marks left by the planer...love it! I waxed it to bring out the rich color of the wood. 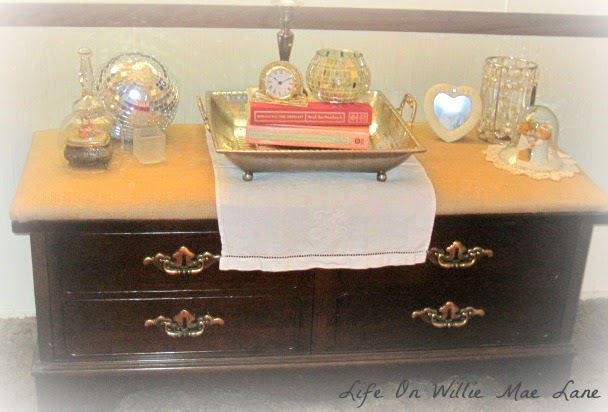 I shopped the house for items to place on the shelf and found some perfect pieces. Of course this will change often, but I love this look for now. Not that you will be surprised, but every single thing in this display was either thrifted or given to me. I was in a quandary trying to decide what to hang on wither side of it when it hit me....my plates I have been collecting for a plate wall. I had four collected and needed one more big plate, so I stole the one on the lower left from my craft room wall. This was given to me by my Aunt Loretta a couple years ago. It was in a box of goodies she bought at an auction. I love the dandelions! I plan to keep adding more plates to the wall, but this was a good start. And speaking of the wall...it will be bead board soon. I am hoping we get to this project by this summer. We are replacing the walls in the dining room and library with bead board and board and batten. So looking forward to this project. We already have the flooring...the same flooring we put down in the guest room last year. We're just saving to purchase all the materials for the walls and the library cabinets an shelving materials. Here's a picture of my dining room....well, most of it. We are planning to replace this table with a farmhouse table with a bench on the back side and 4 chairs...not these chairs, they are uncomfortable and not the look I want. We may build it ourselves if we can't find a used one we really love. I also want a pretty rug to go under the table, new curtains, and a beautiful light fixture to hang over the table....preferably a vintage chandelier. So, what do you think? I just love it and it is my favorite project completed this week. I will be sharing the others soon so stay tuned! Have a blessed and beautiful day everyone. Hello and Happy Sunday everyone! I can't believe this is my last day of spring break....this week really flew by! I am so happy to have been able to check off everything on my To Do list this week though...and it was a pretty long list! Not only did I accomplish everything on my list, but I also completed a few projects which I will share soon and I had a lot of fun too. I am blessed and feel refreshed and ready to go back to work and see my kinders. The living room side tables all got tweaked as well. 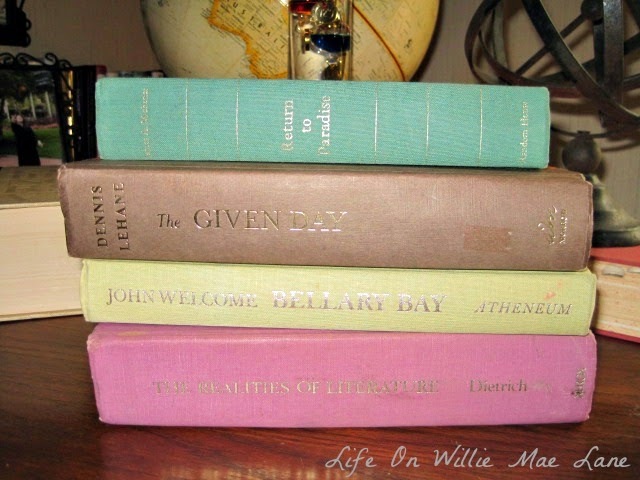 I switched out the darker colored decorative books for ones with green and blue spines. I added more aqua blue to the palette and kept the silvers and golds. Love the sweet little bird cage. And I love my new coaster I got a the thrift store for $0.47. I think it is actually a candle base but it will be serving as a coaster for me. It is really pretty and heavy metal. I also found this white ceramic candle base (seen on the left) for $0.53. I like to use these for not only candles, but risers for various objects. I didn't have a white one so I had to have this one at that price. I like this vignette....reminds me of an old classroom. Love all my old dictionaries. The globe is perched on a rusty old scale. It was a freebie but it had no stand. I found one for it today and will be working on that this week. The old globe on the stand I bought has some damage, but I have plans for it as well. I love my Galileo thermometer on the left and the armillary too. This is in my library area. We are hoping to build floor to ceiling shelves and cabinetry in this area this year. Can't wait! 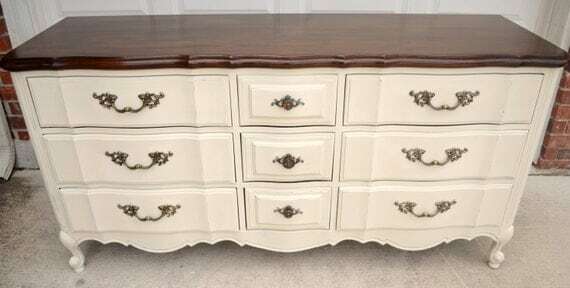 I have never shared pictures of my French Provincial dresser before. I bought this about 3 or 4 years ago with matching nightstands. It is by United and very well made. I fell in love with it the instant I spotted it at the thrift store and just had to have it. I plan to eventually move it to the dining room to use as a buffet. It is much better quality than the one I am using in there now and it is larger so it will hold more of my dishes and linens. It will be getting a makeover before it becomes the buffet, but that won't be anytime soon. 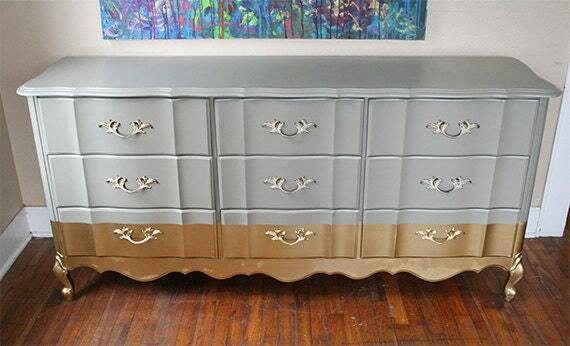 These dressers are quite costly and go for $300 to $1,300 online. This one is on Etsy for $1,250! 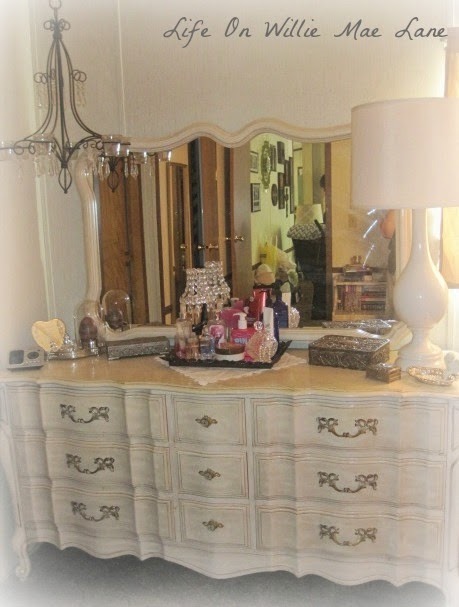 I gave $175 for the dresser, mirror, and two nightstands. Quite a steal compared to what they sell for online! I love the silver leaf on this one....gorgeous! 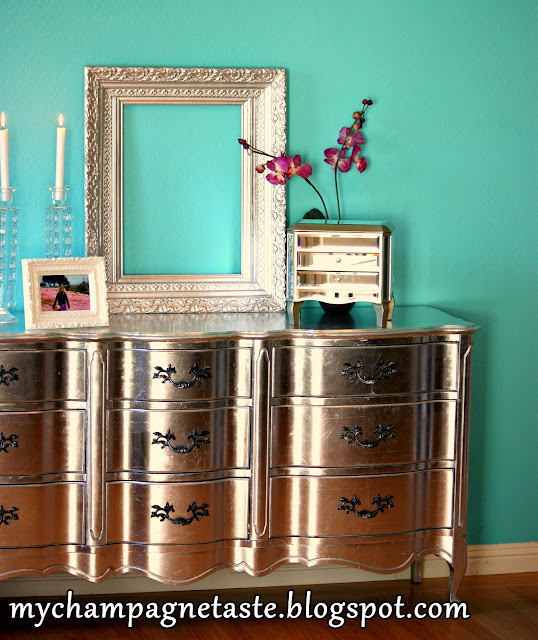 It's not for sale...a very talented blogger redid this one for her glamorous bedroom! I am thinking something along these lines for mine.....love it! Which one do you like best? You can see lots more examples here...if you're interested. So...that's all I am sharing for today. I hope you have a lovely Sunday. So...are you in the mood for a little something sweet today? If so, then you're in for a treat! Just in case you're wondering, every item on this table was either thrifted or gifted to me, with the exception of the little green dish holding the strawberries. It came from TJ Maxx or Marshall's and was only a few dollars. I've had it for a couple years now so I don't remember for sure. I started with my woven, red placemats and topped them with my beautiful white china (one of my best thrifty deals ever) and then placed my sweet little strawberry plates on top. I love the pattern and the colors in these plates. Yesterday I mentioned that I bought a small item at the Habitat for Humanity ReStore and said I would share it later. Well, this is what I bought. The little vintage metal tray...it was $0.99. I know this is overkill with the strawberry themed items, but I wanted to incorporate all of them since I most likely will not create another strawberry themed table until next spring. The runner and the napkins were sent to me by my lovely friend Bev. She has a tablescaping blog...Tablescapes by Bev. Be sure to go pay a visit. She is a wonderful lady! The napkins are so sweet...I love the muted pinks and greens in them. Another sweet blog friend, Linda, sent me this sweet vintage strawberry dish cloth. Linda's blog A La Carte is similar to mine...she shares all sorts of things and is such a sweetheart. The dish cloth could be used as a runner as well, but since I could only use one, I placed it in the metal bucket which you can see from the back side. The little green dish holds some fresh strawberries I bought at Sam's Club yesterday. On that note, let me share the desert I made for the hubby and I last night. The pound cake also came from Sam's. It was so moist and yummy! We love toasted pound cake. I don't know if you've ever tried it, but if not, you should. My late father-in-law loved toasted pound cake with butter and he introduced me to this a few years ago and I fell in love with it. I think of him every sincle time I toast my pound cake and it always brings a smile to my face. I sure do miss him. Well, I toasted our pound cake and buttered it, but I also topped it with a few of these. I cut them up and sprinkled a little sugar on them a few minutes before I toasted the pound cake and they were ready when it was. I topped it with a spoonful of the strawberries and we had an instant desert. I didn't have any cool whip or anything, but it was just as good without it to me. And that folks is it for today. As I type this, it is pouring rain outside....and thundering! I love the sound of the rain on my tin roof. I love that my flowers are being watered so I don't have to for a couple daynd I love that it has lulled Sadie to sleep on the couch and my hubby in the floor. Something is wrong with that picture...lol. The hubby has always loved to sit and lay in the floor. When we put in our laminate flooring, we will have to have a nice, soft rug for him to sleep on...:) What I don't love is that I had a fun project planned for today and didn't get to finish it due to the rain. It's all good though...maybe I can finish tomorrow. I hope this finds each of you doing well and loving life. I have thoroughly enjoyed my spring break and am happy to still have two days off before I head back to work. Now I can begin the countdown to summer break. Hey...it's what we teachers do! A Walk and a Few Finds! Care to go walking with me? 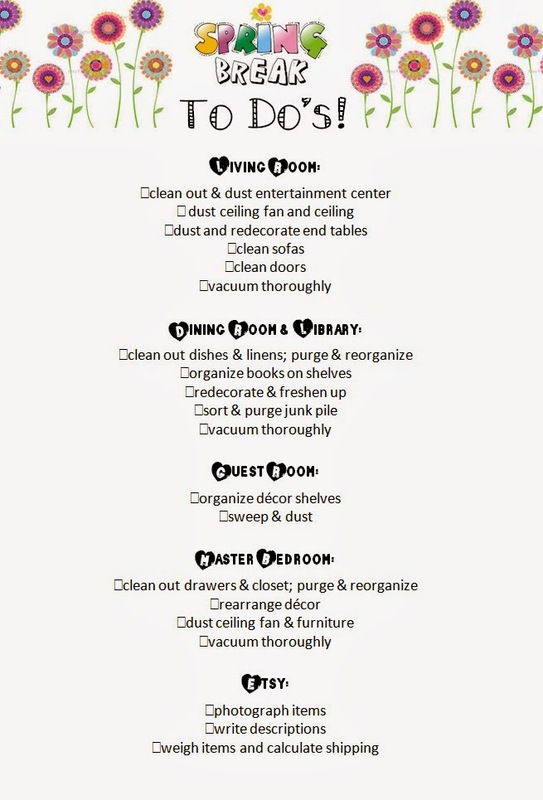 In the midst of my spring cleaning, I have carved out time to do things that feed the soul. One of those things are my evening walks. I met mama down the road and she had a little treat for me. 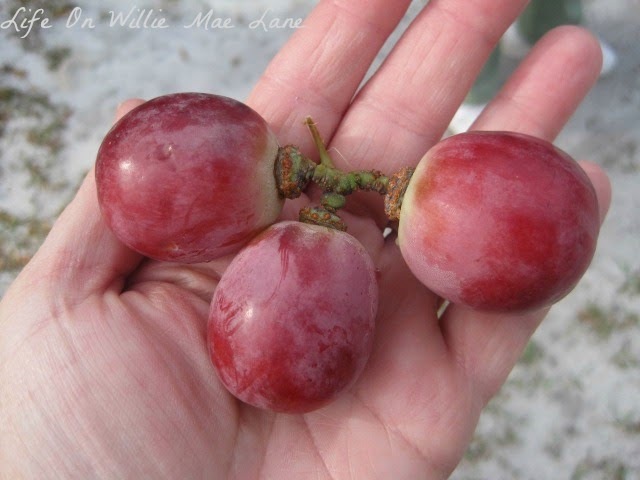 Check out these huge grapes! She bought them at Sam's Club. I have never seen such huge grapes in my life. I thought they were plums to begin with...lol! We walked down Willie Mae Lane to my Aunt Loretta's house for a short visit. This pine tree branch frames the goat pasture beautifully. You can even see one of the goats if you look close. The wild grapevine is budding out. These fresh, tiny leaves are so pretty. OK...here we are...at Aunt Loretta's place. Aren't her azaleas just gorgeous? Chip is getting up from his resting spot to greet us. The wild ivy trails down from the live oak tree in huge clusters. The bridal wreath blooms are so fresh..I love the crisp white. Love this shot with the old cattle trailer in the background...and a glimpse of the old shed. The sun was setting and shining through the green glass of the hummingbird feeder. This reminds me I need to fill mine so I will get some of the little visitors. The lavender wisteria is the perfect companion to the arbor. This old metal bird house is so charming with all the layers of chippy paint and an old nest peeping out the hole. We had a lovely visit with Aunt Loretta but had to get back home before dark, so we headed back up Willie Mae Lane. Along the way, I noticed two large rocks...one lime rock and one asphalt from our road that is partially covered in milling. I kicked them to the side of the road one at a time and this is where they came to a rest. 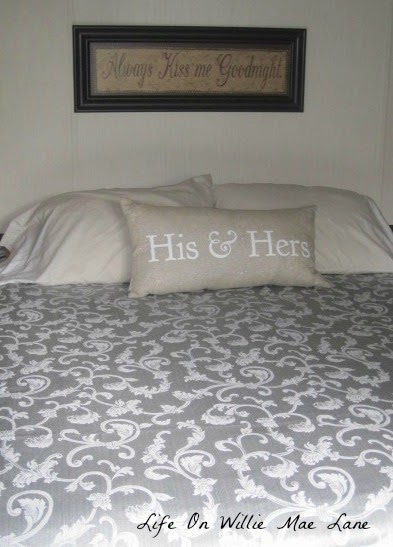 I promise I didn't stage them...:) I do love a sweet vignette, but this would be going too far! Even my sharing the picture is going a little too far...I promise I'm not crazy...lol! I thought it was pretty and I instantly though of the old song...Ebony & Ivory. Remember it? Ebony and Ivory....live together in perfect harmony. Side by side on my piano keyboard oh lord why don't we. Remember above I said I have been carving out a little time to have some fun. Well, today I went to Gainesville with my mom after I dropped Sadie off a the vet to be spayed. We had a great day! We ate a delicious lunch at 4 Rivers Smokehouse, then went to the Goodwill and Habitat for Humanity ReStore. That was my first trip there and I was disappointed with the prices. Way too high! I did get a couple little things....and a few free books. I love these old books to decorate with. One of the things I will share soon and the other is to put in my Etsy shop. 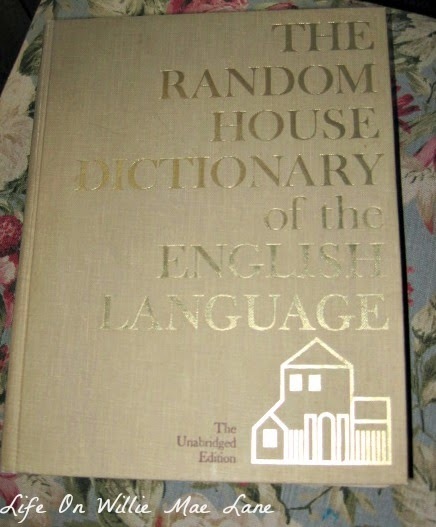 I bought this ginormous dictionary for some projects I have in mind for my Etsy shop. It weighs just under 10 pounds. I know because I weighed it on my new postal scale that had been delivered while I was out and about...:) I paid $5 for it but will make way more than that off the projects I have in mind. I was really good today and passed up several items I normally would have tossed in my cart. I am trying really hard to only buy things I have a definite plan for or that are on my list. At the Goodwill, I found something that made me swoon! 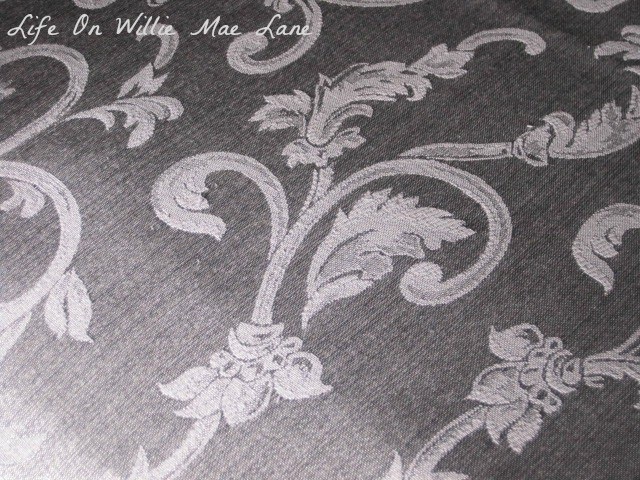 Check out this grey jacquard fabric below. It is a huge piece...approximately 5'X10'. It is hemmed on all edges and I believe it was a tablecloth. I'll be using it, along with a couple other fabrics to create a gorgeous new comforter for my bed. I am beyond thrilled with this purchase...it was $4.99! Did you notice that amazing pillow? I purchased it a few weeks ago to put away until I get everything together for my room redo. 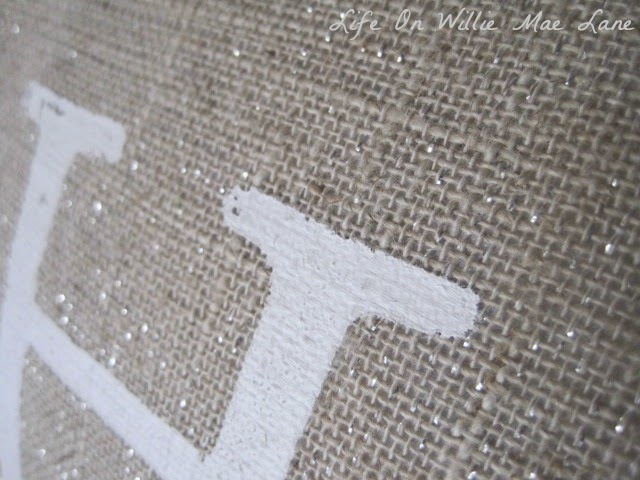 It is burlap with silver glitter...I am in love with it. It is going to be perfect with the room I have envisioned! I bought a few other items at the Goodwill...three for resale and one to redo before I share. 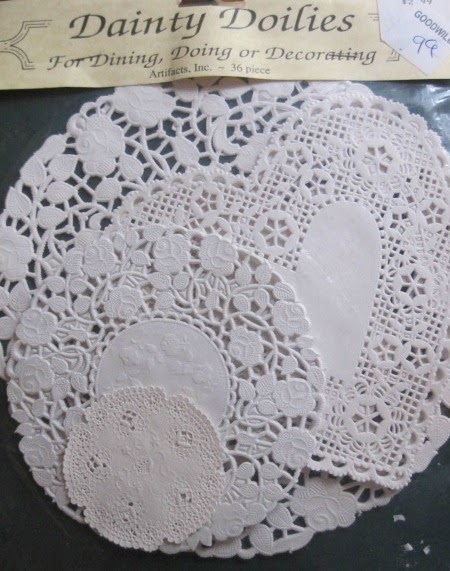 I also bought this unopened package of doilies to use in my Etsy packaging. They were only $0.99. So, that's it! Much less than my usual...right? We went to Sam's Club and I bought some grocery items and then we headed home. It was a really nice day out with mama....always is! Oh...by the way, Sadie made it through her surgery and is currently snoozing on the couch. She is so groggy and disoriented from the anesthesia. Poor baby...:( I'm sure she'll be feeling a little more normal tomorrow. Have a fantastic Friday everyone. I am hoping to get the paint out tomorrow so maybe I will have a new project to share soon! Sweet Saturday With the Sister! Sometimes Life Just Gets Busy!